Little is known about the artist who painted the portrait of Susan Bronnenberg Nelson. The painting is signed “Pauling” and dated 1875 with nothing more noted on the back of the canvas. Claire Somerville, L. Ward Nelson, and Carl Whitney, descendants of Susan Bronnenberg Nelson, donated the painting to the Museum of Nebraska Art in 1993. The donors thought the artist might have been Otto Pauling from Indiana. 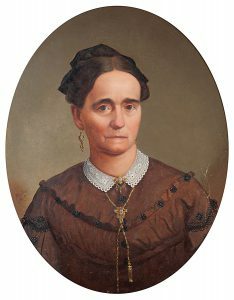 The painting appears to have been painted by a competent portrait artist who was probably professionally trained but a search of 19th century artists in Indiana, Illinois, and Ohio did not discover any artists with the name Pauling. Additional research located several members of a Pauling family who immigrated to the United States from Germany in the 1800s. One was a Fried Pauling and his occupation was listed as “painter;” he had a son named Otto. Whether one of these men might have been the artist is uncertain. The donors related that Mrs. Nelson was in the process of moving from Indiana to Nebraska with her sons but was murdered en route. Subsequent research located the very tragic story of Susan Bronnenberg Nelson’s death which reads like a modern-day crime scene investigation story. She was murdered in the fall of 1888. She apparently had made plans to leave her home in Anderson, Indiana, and possibly move to Kansas City to assist one of her sons who was ill at the time. A hunter found her remains in a wooded area not far from Terre Haute, Indiana. The investigation led to a man by the name of Perry Manis, with whom Mrs. Nelson was acquainted. Manis was caught and convicted, and he died while in jail. Mrs. Nelson’s sons homesteaded in Buffalo County, Nebraska, where members of the family continue to live. The Museum of Nebraska Art Collection has one work by Pauling. Researched and written by Gary Zaruba and Jean Jacobson, 2013, a project of MONA’s Bison Society.